An insufferable group of middle class prats and their dubious morals and infidelities as they all have affairs. Some try to be so very jolly hockey sticks decent about it (Richard Attenborough, Lee Remick) and others (Ian Holm, Jennie Linden) seem crushed ... and hypocritical, particularly Holm. Claire Bloom is very judgemental but proves to be very twisted, ditto Attenborough; Clive Revill and Ann Firbank just seem to be having fun. Agreeable if maddening adaptation of Iris Murdoch's 1961 book that predates the free love generation by several years but this film version released afterwards strikes me as being an examination of middle class folks trying to adapt to it in their own way. Interesting, occasionally funny but I just couldn't relate to any of them and as such found it uninvolving and by the end somewhat baffling despite excellent performances, fine direction and good production values. This isn't a dynamic looking film; it has a straightforward, naturalistic, stagy look. Consequently the image is very true to it's source with a fairly robust if then fashionable use of colour; not striking but solid and somewhat naturalistic. Black levels are excellent and I couldn't see any signs of crush and contrast is fairly low key which suits the largely interior based drama. The OCN has been looked after and I saw no traces of damage or wear. This has the usual maxed out bitrate and topnotch encode; no gaps in the grain and no signs of posterisation, mosquito noise or other unwanted artefacts. 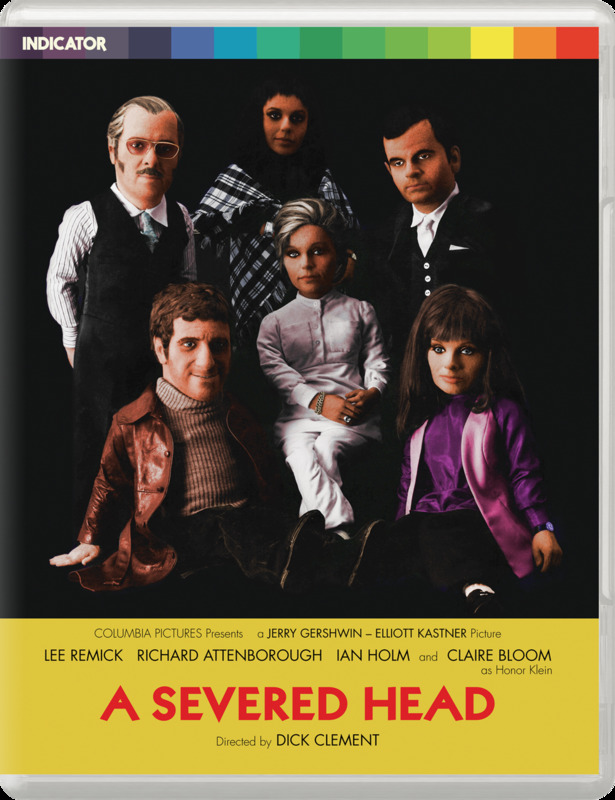 No signs of DNR or edge enhancement; A Severed Head gets a fine Indicator Series Blu-ray release. Straightforward mono track typical of a prestige drama film of the period. Dialogue is the main focus and Stanley Myers score is supportive and never interferes. There is a natural flatness typical of mono tracks but it serves the film very well. Subtitles are essential for the hearing impaired and those provided seem comprehensive. Solid commentary covers all the bases. Clement is a natural raconteur and has plenty of amusing stories and trivia about the production. Dunn does a fine job keeping Clement on track. The poster features some creepy dolls made to be striking resemblances to the cast and this fascinating piece features the artist who created them. De Boer had been known for doing these caricatures and she explains how that led to the gig on A Severed Head. Burrill discusses Winkast the production company and the making of the film from his perspective. We here that he was only involved with the physical production and his impressions of the cast. An interesting analysis of the book and the film, it's title and and the themes therin. I find Deering's point that the book heralds from the beginning of the decade and the film from the end and despite being a very faithful adaptation. The intervening evens of the decade suffuse through the drama changing it somewhat. Typical trailer of the period. Decent HD gallery; brief but worthwhile. Excellent Indicator series limited edition booklet. As usual it adds a great deal of context to the appreciation of the film. Although I'm happy to have seen this film, it didn't bowl me over and the characters were hard to relate to. However, the transfer is typically first class from Powerhouse Films and the extras add a great deal of appreciation for those so inclined.